NANOMATERIALS AND NANOTECHNOLOGIES FOR ANTIallergenic BIOFUNCTIONALIZATION OF FABRICS *Loti Cornelia OPROIU, Anca Angela ATHANASIU, RUSE Mircea, Elena. *Loti Cornelia OPROIU, Anca Angela ATHANASIU, RUSE Mircea, Elena IONITA, DEACONU Marian, TOLESCU Ciprian, FARAON Victor ; **Marieta NICHIFOR; ***RADU Cezar Doru, Mihaela HRITCU; ****Lucia BOSCA, Elena Alina NANU; *****Stela FLORESCU *Institutul National de Cercetare Dezvoltare pentru Chimie si Petrochimie ICECHIM Bucuresti; **ICMPP-Iasi; ***UTI-Iasi; ****BIO HIGH TECH Ltd Bucharest; *****CHEMIX Ltd Bucharest HUMAN SKIN LAYERS ALLERGY, DERMATOLOGY, BIOACTIVE COMPOUNDS, TEXTILE SUPPORTS OBJECTIVES The problem of allergies is rising nowadays, in an acute mode, because, inter alia, a study reached the conclusion that in 2015 one of two Europeans, most of them children, will suffer from allergies. Allergy: is a skin inflammatory syndrome, clinically defined through a succession of skin modifications, characterized by: -clinical signs: erythema, vesiculati, exudation, crusting, desquamation and sometimes lichenification; -discomfort sensations: pruritus. Allergy is the result of exposure to a substance with destructive effect over the dermal barrier function, its immune system can no longer recognize the substance correctly as harmful and release histamine to protect. Histamine is responsible for many symptoms from allergy clinical table. More than pollution itself, the problem is the apparition of new allergens in our daily life: cosmetics and hygienic products, aliments, materials, plants, pollen, dust/mites/pet hair, some metals, drugs, detergents and even stress some negative influences of textile fabrics on human health through enhancement, i.e. dyes, chemical auxiliaries, synthetic fibers and modes of cleaning and maintaining the textile fabrics. Dermatologic affections, as seen above, are very various as manifestations, therefore their treatments with bioactive compounds impose treating of inflammatory or degenerative affections, with acute or chronical evolutions (eczema, acne, furuncles, wounds, etc. ), where the recommended treatment is intern (diuretic, antiallergenic, vitamin-therapy) associated with extern (extracts with local calming actions, with antiseptic, emollient properties) There is a lot of bioactive compounds that can be used in the treatment of these allergies, because of their antiallergenic properties themselves, but also because of anti-inflammatory, calming and disinfection properties that can ameliorate these processes, as: azulenes, flavones, etc. These active principles determine the histamine-forming tissues to release histamine in small amounts and which, repeatedly produced, remove the allergenic states to dust, pollen, acting by specific desensitization to a known allergy factor. The condition for the treatment of functionalization with biocomposites with antiallergenic properties to be uniform on the surface of textile fabric in depth, is that the support has itself some structural characteristics that develop these properties. This is realized through topic creation of a reservoir of active substance with relative persistence, which to ensure on the lifetime of the product diffusion/influence of active principles, in a transdermal way, with resistance at 5-10 washings. The criteria for development of the new fabric, that synergize with the active principles and ensure a proper functionality are: -Air circulation (air permeability); -diffusion of body heat (low thermal resistance); -very high permeability for water vapors; -very good transfer of humidity. GENERAL OBJECTIVE -development of new “clean” technologies and nanomaterials for bioactive barrier type antiallergenic functionalization of cotton fabrics SPECIFIC OBJECTIVES fundamental understanding of phenomena and processes occurring at the nano-scale (bioactive nano-compounds, nano-encasing, etc), as well as those occurring at the interface between the polymer matrix and the fabric underlayer; synchronization: disease / target factors to annul/ fabric underlayer; obtaining synthesis / preparing / acquiring of natural bioactive compounds extracted from plants, of polymerizable bio-composites by embedding the bioactive compounds (directly or previously nano encased) in solutions/ suspensions / emulsions of some olygomers/ polymers as compatible with the bioactive substances and human skin-biocompatible, of some fabrics designed for various destinations and of the finished fabrics obtained by coating/ depositing of the polymeric film. ALLERGENIC REACTION OF HUMAN SKIN EXPERIMENTAL PART Preliminary study for characterization of somenatural bioactive compounds with antiallergenic properties Development and realization of a 100% cotton fabric, antiseptic, prepared for bioactive functionalization The present paper reflects the actual phase of our experimental studies that concern the identification and the evaluation of the non-allergenic/anti-allergenic properties and of some secondary properties: anti-microbial, antioxidant, antiviral, anti-fungi, emollient of some vegetal extracts from the spontaneous Romanian flora, as well as other exotic floras, using a synergetic action over the human tegument. Active substances with benefic effects in allergies are: flavonoids, saponins, polyphenols from caffeic acid, volatile oils (themselves or different derivatives), polysaccharides, as: Rutoside ferulic acid bisabolon-oxide etc. There were analyzed through GC-MS three essential oils with antiseptic, antifungal, antipruritus properties, one of them being experimented for biofunctionalization on cotton, with verified antimicrobial effects and in course of dermatological tests. Characteristics for 100% cotton fabric (degreased and sterilized) Structure: Diagonal threads: T in tex or (Nm): Warp = 27,7 (36) STAS 6430/87 Weft = 31,25 (32) Density of threads: threads/cm Warp= SR EN /00 Weft=19 Specific Mass =141 g/m SR EN 20139/99 Thickness = mm SR ISO 5084/01 Breaking load	Warp= 423 N SR EN ISO /02 Weft=302.8 N Break elongation: Warp= 16,59% Weft=24(%) Friction resistance (mass loss at 2800 cycles)=1.55% SR EN ISO 12947/00 Air permeability = 708 liters/m2/sec SR EN ISO 9327/99 Water sorption capacity =182% STAS 12750/89 There are emphasized the hygienic and physiologic indexes (air permeability and hydrophilic character) considerably greater than a normal cotton fabric. These were achieved through the preparation and sterilization technology. Preliminary experiments for impregnation of 100% cotton with bioactive product Methods and techniques for dermatological characterization of bioactive compounds depposited on cotton fabric, in order to establish/verify their non-allergenic properties for human skin Experiments of bioactive functionalization with antiallergenic properties for 100% cotton fabrics One have made impregnations on the newly created cellulose textile using the natural extracts of different concentrations with and without reticular agent. Three samples were prepared: VT1, VT2 and VT3, by treating around 3000 cm2 100% cotton fabric for each sample (this being the necessary surface for subsequent dermatological tests). The samples were impregnated, introduced in polyethylene bags in order not to be contaminated with possible allergens from environment and sent to the Partner in charge with dermatological tests in order to be firstly tested for non-allergenic properties. Dermatological experiments. In vivo tests for confirmation of compatibility with human skin and absence of allergenic potential (international accredited laboratory) Objective for study: (According protocol) confirmation of skin compatibility and absence of allergenic potential Products names: VT1 Ref. : , VT2 Ref. : and VT3 Ref. : Panel: 50 subjects, years old, F/M, photo type (Fitzpatrick): II – IV, reactive skin Methodology: according the method elaborated by Marzulli and Maibach, which creates favorable conditions for artificial induction of a possible allergy, revealed in induction stage. For evaluation of antiallergenic potential, the interpretation of the results is performed according to international scale ICDRG (International Contact Dermatitis Research Group). For the same reason concerning the creation of a functionality anti-allergenic of the textile surface, one have realized synthesis of some polymeric compounds and their precursors, like monomers, olygomers and natural macromolecular derivates of saccharydes and polysaccharide types. 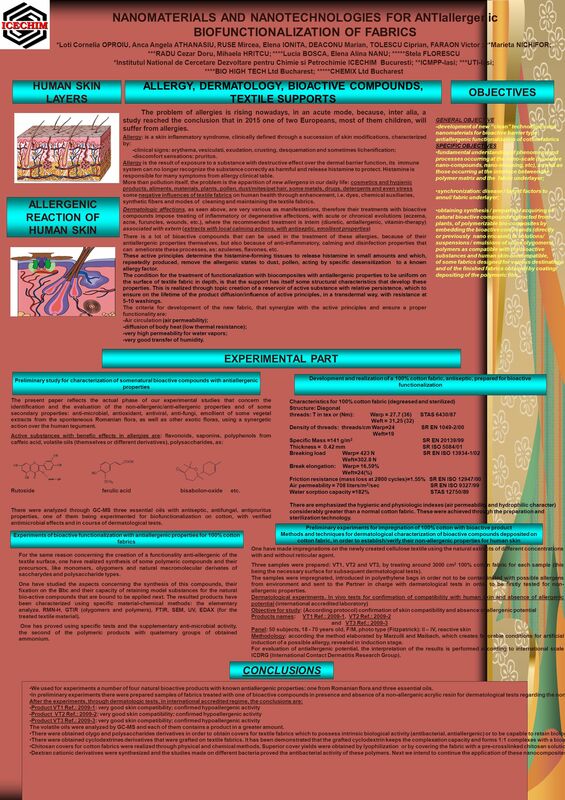 One have studied the aspects concerning the synthesis of this compounds, their fixation on the Bbc and their capacity of retaining model substances for the natural bio-active compounds that are bound to be applied next. The resulted products have been characterized using specific material-chemical methods: the elementary analyze, RMN-H, GTIR (olygomers and polymers), FTIR, SEM, UV, EDAX (for the treated textile material). One has proved using specific tests and the supplementary anti-microbial activity, the second of the polymeric products with quaternary groups of obtained ammonium. CONCLUSIONS We used for experiments a number of four natural bioactive products with known antiallergenic properties: one from Romanian flora and three essential oils. In preliminary experiments there were prepared samples of fabrics treated with one of bioactive compounds in presence and absence of a non-allergenic acrylic resin for dermatological tests regarding the non-allergenic properties and realization of optimal conditions of source formation, of a “reservoir” of vegetal product on the fabric, which to last for 5-10 washings. After the experiments, through dermatologic tests, in international accredited regime, the conclusions are: -Product VT1 Ref. : : very good skin compatibility; confirmed hypoallergenic activity -Product VT2 Ref. : : very good skin compatibility; confirmed hypoallergenic activity -Product VT3 Ref. : : very good skin compatibility; confirmed hypoallergenic activity The volatile oils were analyzed by GC-MS and each of them contains a product in a greater amount. There were obtained olygo and polysaccharides derivatives in order to obtain covers for textile fabrics which to possess intrinsic biological activity (antibacterial, antiallergenic) or to be capable to retain biologically active compounds There were obtained cyclodextrines derivatives that were grafted on textile fabrics. It has been demonstrated that the grafted cyclodextrin keeps the complexation capacity and forms 1:1 complexes with a bioactive, standard-considered, compound. Chitosan covers for cotton fabrics were realized through physical and chemical methods. Superior cover yields were obtained by lyophilization or by covering the fabric with a pre-crosslinked chitosan solution Dextran cationic derivatives were synthesized and the studies made on different bacteria proved the antibacterial activity of these polymers. Next we intend to continue the application of these nanocomposites on 100% cotton fabrics for chemical textile finishings, testing of non-allergenic/hypoallergenic properties, as well as starting the synthesis of some non-allergenic polymers, following the same studies, in order to obtain nanocomposites with antiallergenic/antimicrobial properties. Download ppt "NANOMATERIALS AND NANOTECHNOLOGIES FOR ANTIallergenic BIOFUNCTIONALIZATION OF FABRICS *Loti Cornelia OPROIU, Anca Angela ATHANASIU, RUSE Mircea, Elena." The Chain of Infection. As healthcare professionals, it is important to understand two facts about infection As healthcare professionals, it is important. TENDER BIOTOUCH Auxiliaries made with Skin Care ingredients. 1 A biofilm (literally = living thin layer) consists of a community of micro-organisms of various species, which are bound in a three-dimensional matrix. Hand Hygiene Janet Weber, RDH, MEd. Why Is Hand Hygiene Important?  Hands are the most common mode of pathogen transmission. Wound infection. Wound infection has a significant impact on economic and Patient outcomes (IWJ 2008), However it is often misdiagnosed and mistreated. Hazard Communication 29 CFR Compliance Training Presentation. Using Disinfectants and practicing Sterilization in the Veterinary Clinic. SHADY. K. E. NATIONAL INSTITUTE FOR STANDARDS, GIZA, EGYPT CHANGE IN THE SURFACE MORPHOLOGY OF VISCOSE FABRICS BY EXPOSURE TO SUNLIGHT.